Need ideas for your next trip? We've got over 41,097 attractions and things to do covering the United States and Europe. So many choices, so little time! From coast to coast, the United States has plenty of things to do, places to go, and experiences to savor. There are literally thousands of attractions and events that will satisfy the whims and fancies of all crowds. Take a day trip to internationally acclaimed museums in New York City, visit the numerous amusement parks of Florida, or tour the wineries in California, where some of the finest wines in the world are produced. Browse through photos and read thousands of expert and candid reviews from real travelers just like you. And don't be surprised if your next U.S. trip involves a hidden gem uncovered from our comprehensive list of attractions and things to do. Europe is home to some of the world's greatest historic sites and archaeological ruins, so it's no surprise this inclusive list of attractions and things to do in Europe is filled with remarkable entries. Experience an eerie shiver as you ponder the mysterious construction of the stonehenge. How about strolling through Piazza San Marco, arguably the most famous square in Europe? Want to travel back in time to the gothic ages? Visit the well preserved Warwick Castle in England, a favorite among families of older children and teens. 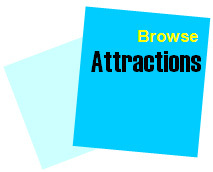 There's plenty more attractions, museums, and sightseeing, so go ahead and browse.